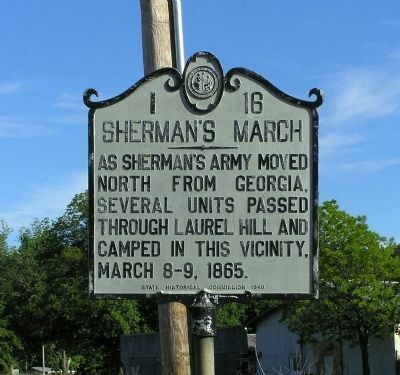 As Sherman's army moved north from Georgia, several units passed through Laurel Hill and camped in this vicinity, March 8-9, 1865. Location. 34° 48.532′ N, 79° 32.888′ W. Marker is in Laurel Hill, North Carolina, in Scotland County. 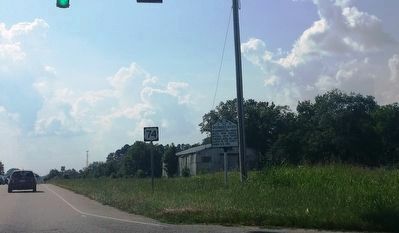 Marker is at the intersection of Andrew Jackson Highway (U.S. 74) and Morgan Street (North Carolina Highway 144), on the right when traveling west on Andrew Jackson Highway. Touch for map. 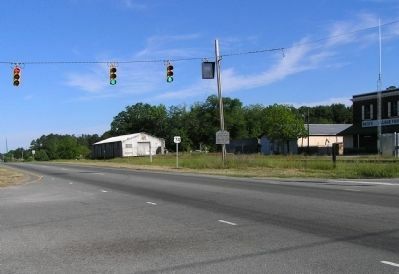 Marker is in this post office area: Laurel Hill NC 28351, United States of America. Touch for directions. Other nearby markers. At least 8 other markers are within 6 miles of this marker, measured as the crow flies. Ida Yarn Mill (approx. 1.2 miles away); Murdoch Morrison (approx. 1.3 miles away); Murdoch Morrison Gun Factory (approx. 1.3 miles away); Original Richmond Cotton Mill (approx. 1.3 miles away); Original Springfield Cotton Mill (approx. 2.1 miles away); James Lytch (approx. 4.4 miles away); Old Laurel Hill Church (approx. 5 miles away); Terry Sanford 1917-1998 (approx. 5.3 miles away). Touch for a list and map of all markers in Laurel Hill. Click here for a list of markers that are related to this marker. To better understand the relationship, study each marker in the order shown. Credits. This page was last revised on November 14, 2016. This page originally submitted on May 31, 2010, by PaulwC3 of Northern, Virginia. This page has been viewed 927 times since then and 11 times this year. Photos: 1, 2. submitted on May 31, 2010, by PaulwC3 of Northern, Virginia. 3. submitted on November 14, 2016, by Michael C. Wilcox of Winston-Salem, North Carolina.